Introduction: Gena Philibert-Ortega is a genealogist and author of the book “From the Family Kitchen.” In this blog post, Gena discusses—and provides links to—seven top online resources for researching your American Revolutionary War ancestors. Do you have a Revolutionary War ancestor? Maybe you have always heard that your ancestor was a soldier or a patriot during the American Revolution. Perhaps you have a female ancestor who was a member of the Daughters of the American Revolution (DAR). Do you have copies of your ancestor’s military records but are not sure where to go next with your family history research? 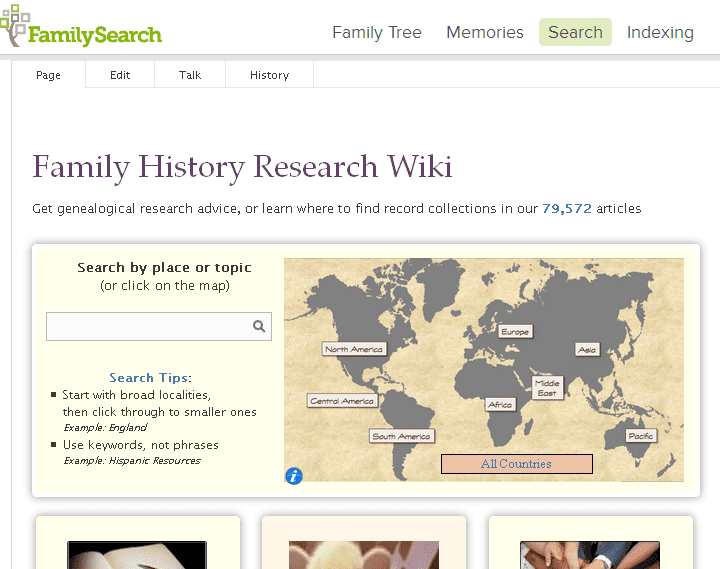 It’s time to make a genealogy research plan. 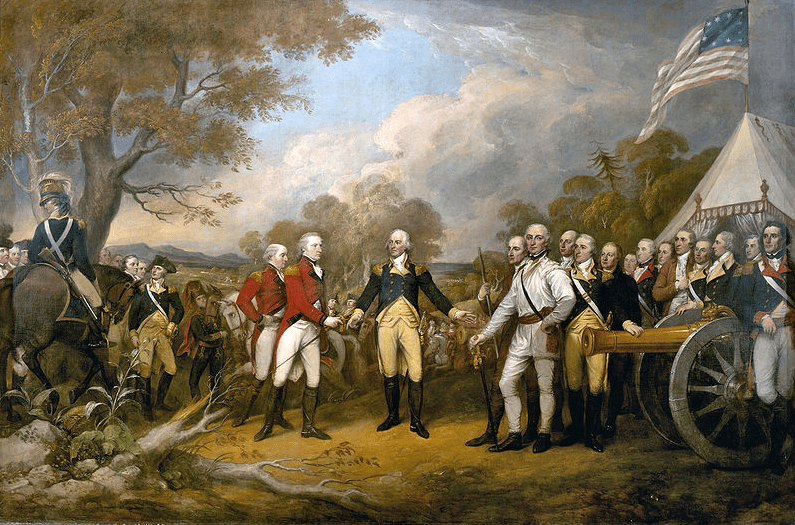 Painting: surrender of British General John Burgoyne at Saratoga on 17 October 1777 to American General Horatio Gates, by John Trumbull. Source: Wikimedia Commons. When thinking about researching your Revolutionary ancestor, consider what records may be left behind that result from his military service, death, and even his legacy. * Also keep in mind where such records may be held. 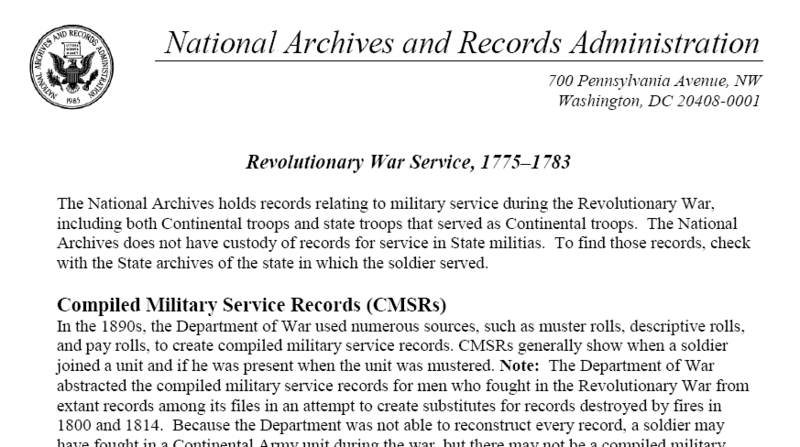 While it’s easy to assume that the majority of records will be found at the National Archives or a subscription-based website, there are various online repositories with historical Revolutionary-period records useful to your ancestry research. Ask questions of each record you find and then look for documents that answer those questions. While some of the research you do will involve looking for documents that include his name, there will be general histories about events your ancestor was involved in—which don’t specifically mention him by name—that you will also want to consult to learn more about his day-to-day life in the battlefields and political developments of the time. Not sure where to start? 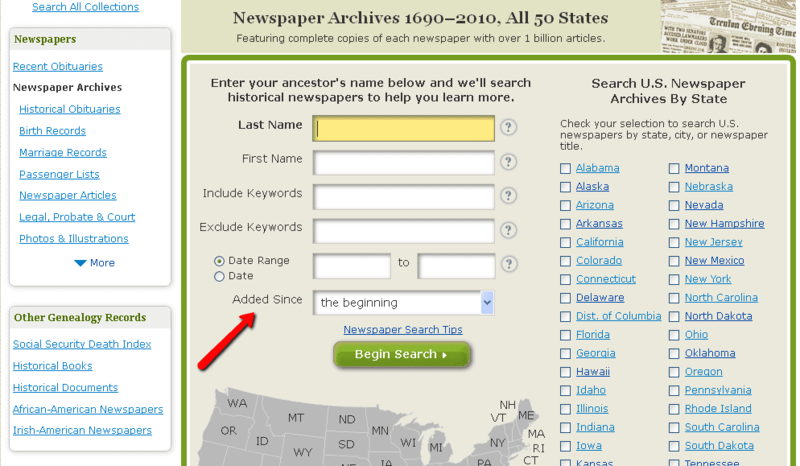 Begin first with an overall search of newspapers and digitized books. In my previous article Tracing Your Colonial & Revolutionary Ancestry in Newspapers, I wrote about articles that can be found in GenealogyBank’s Historical Newspaper Archives for finding your Revolutionary War ancestor. Whether you are just starting your research or have been at it for years, you should begin with newspapers to see what more you can learn. Because GenealogyBank is constantly adding newspapers, searching just once is not enough—keep coming back, to search the new material. A helpful feature of GenealogyBank’s Newspaper Archives search page is that you can narrow your search to an “Added Since” date so that you are not going through the same results you viewed previously. Obviously, one of the newspaper article-types that you will hope to find is an obituary. An obituary may provide key information including family members’ names, military service, occupation, and the cemetery where he is buried. One resource researchers might not be as familiar with is GenealogyBank’s Historical Documents & Records collection, which includes the American State Papers. These federal government documents can include mentions of Revolutionary War soldiers—and their widows—as they applied for things like pensions. Search Tip: As you search the GenealogyBank collections, make sure to keep in mind name variations. Don’t just stop after searching one version of your ancestor’s name. Write out a list of various name combinations that take into account their initials, name abbreviations (Jno, Benj., Wm. ), and nicknames—as well as possible misspellings of the first and last name. In addition to newspaper articles and historical books, there are several online resources available for lists of Revolutionary War soldiers’ graves. 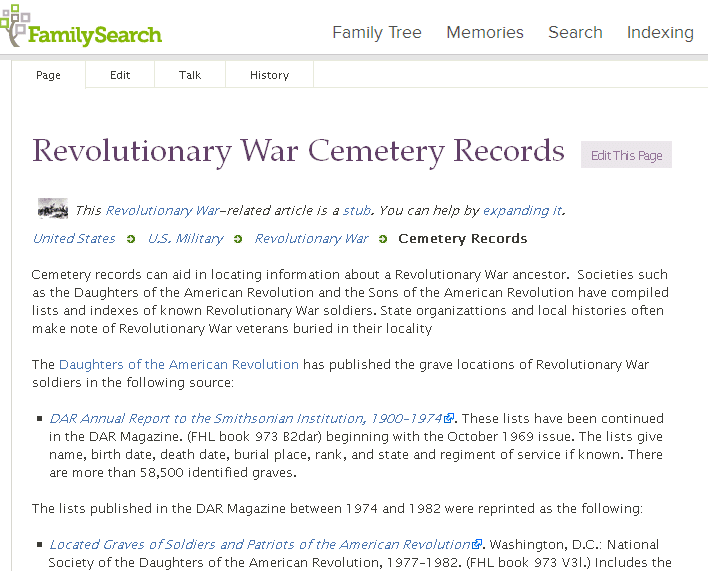 To read more about these resources, see the article Revolutionary War Cemetery Records on the FamilySearch Wiki. Want to verify that your ancestor was a Revolutionary War patriot? Maybe you have a copy of a female family member’s DAR application. 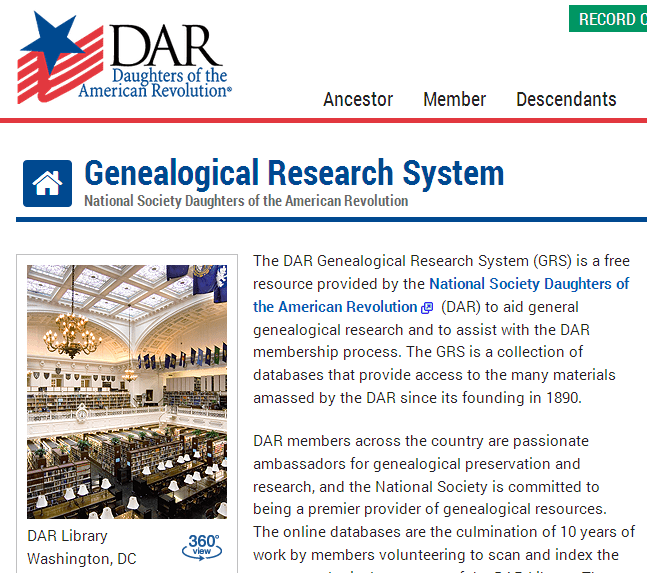 Looking to become a member of the DAR or the SAR (Sons of the American Revolution)? Even if you aren’t interested in joining these groups, they have a vast collection of resources that can help you with your research. According to DAR member and chapter registrar Sheri Beffort Fenley, there are two resources all non-DAR members should use. The second resource Fenley recommends is the DAR Library. 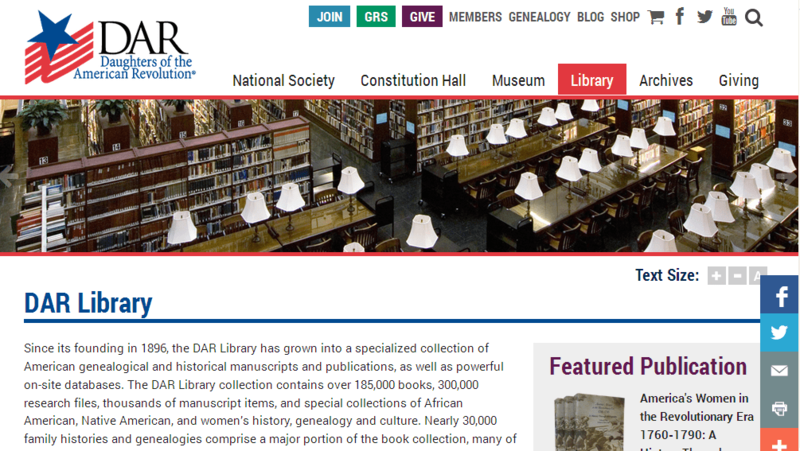 While you are looking at the DAR homepage, make sure to click on the Resources tab. Here you’ll find the Revolutionary Pension Card Index as well as a great eBook entitled Forgotten Patriots: African American and American Indian Patriots of the Revolutionary War: A Guide to Service, Sources, and Studies. I would also recommend using Google Books to look through books and periodicals involving the DAR and their various chapters, as well as other genealogical information from the Revolutionary War. It’s a great place to find lineages and transcriptions. The Sons of the American Revolution Genealogical Research Library in Kentucky also may be of use to your research. 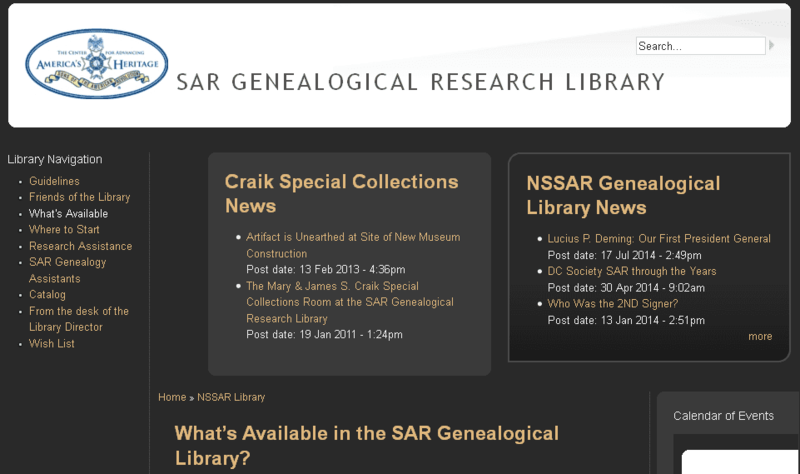 To learn more about their collection and their SAR Patriot Index, see their website. The National Archives holds the records of our federal government, including military records. For the Revolutionary War you can find everything from Compiled Military Service Records to pensions and bounty land records. (Please note that NARA is the caretaker for federal records; they do not have state records such as state militia records. For those records, you need to contact the appropriate state archives.) Click here to see a list of NARA Revolutionary War records. A good tutorial for learning more about obtaining military records from NARA is on their web page: Genealogy Research in Military Records. There are also several Revolutionary War databases available from the free website FamilySearch, including the searchable United States Revolutionary War Pension and Bounty Land Warrant Applications, 1800-1900. Most people automatically think of service records and pensions when they think of military service—but what is often missed are bounty land grants. Military Bounty Land was offered to men in return for their military service. This served as both an enticement and a reward for longer service. Your ancestor may have received much more from his service than just monetary compensation. To learn more about bounty land and how to research it, see Christine Rose’s book Military Bounty Land 1776-1855. The United States Revolutionary War Rolls, 1775-1783 from FamilySearch “contains images of muster rolls, payrolls, strength returns, and other personnel, pay, and supply records of the American Army during the Revolutionary War.” This collection is not searchable; you have to browse it, and you need to know the state your soldier fought for. Make sure to utilize the FamilySearch Family History Research Wiki to learn more about other Revolutionary War documents available from FamilySearch. Wherever you are in your search for your Revolutionary War ancestor, make sure to have a plan and a list of genealogy resources—and then go through each one. Using a combination of sources including newspapers, digitized books, and military records, you can start to put together the story of your Revolutionary War ancestor soldier’s life. * Because the majority of soldiers in the Revolutionary War were men, I’m going to refer to them as “he.” However, women did fight alongside their male relatives on the battlegrounds. To learn more about the women of the Revolutionary War, see the book Revolutionary Mothers: Women in the Struggle for America’s Independence by Carol Berkin. GenealogyBank Just Added 7 Million More Genealogy Records! I would add fold3 and heritagequest. Both have original paperwork from the files. At fold3, if you put in the name, you can get the papers from their files, AND if the name is in other soldier’s files, you can see what they wrote. In the second instance, it is usually that they served with your soldier. There are even some people who write stories about their time serving. These sites can be available for free at a public library. Thanks so much Jacquie for adding that. You bring up a good point, always check your local library and see what subscription websites they offer. Thanks for that information! Always good to have more resources.